Many years ago while we were pastoring at the Fort Miller Wesleyan Church, one of the ladies asked if we knew what Advent Bags were. We didn’t so she put them together. By the time the next Advent had come around we had moved to Martinsville and the paper got lost. A few weeks ago, while unpacking from our move, Dale came across the paper. We both liked the general idea, but thought it could use some tweaking…so using the pattern that we already had and some ideas from our service of Lessons and Carols, we made a new Advent Bag and Devotional. 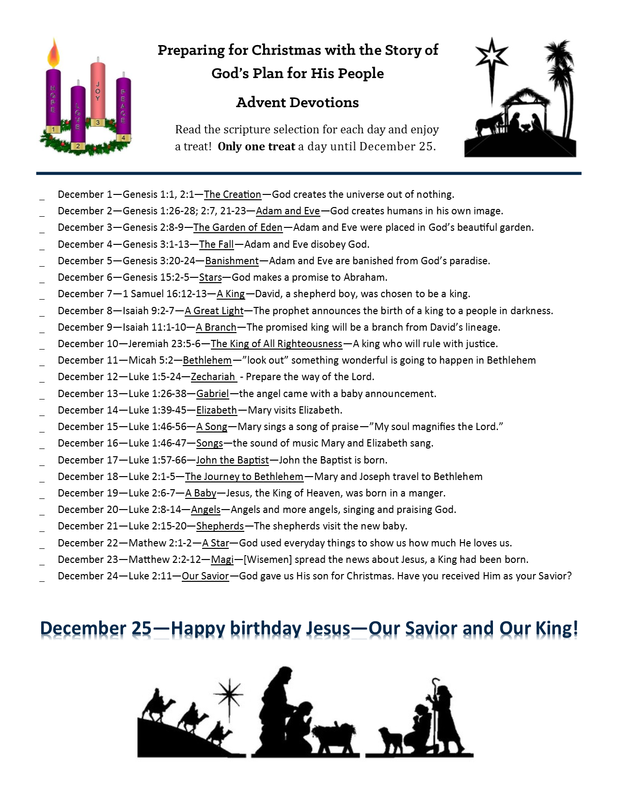 Dale was inspired by the Advent Devotional and created a website out of it. (The website is a work in progress. The first six days are there and he plans to put up three days each day.) Here is the link to what Dale is calling The Advent Project. Dale and I are making this available as a resource, so you are welcome to use it.